All tracks were written and produced at the Globesound Studio. Jairamji (Charlie Roscoe) from well-known Japanese label Dakini Records is truly a very gifted artist being able to transcend boundaries and clichés of his genre. His debut album labeled Kindred Spirits released in 2003 is without any doubt one of the greatest ambient/dub albums of all time. All components of his long and beautiful tracks, whether it is composition, atmosphere, sound or abundant use of various instruments (mainly flute), perfectly fit together and present a unique combination of soulful music and high musical craftsmanship. Especially the flute parts sound almost as the music of the spheres. In my point of view, Jairamji's release can equally match such artist like Puff Dragon, Makyo, or Adam Shaikh. In the end, pure musical experience. This cd, recorded for the great Dakini Records, has everyting I want from an ambient album. I don't want it to be abstract, experimental and without emotions. I want my ambient beautiful, with smooth, hypnotic elements which can take me to other worlds. This cd has it all. The tracks are long, only seven tracks in 77 minutes, and this is just a big PLUS! The tracks takes its time to develope, and there are NO, absolutely NO, disturbing sounds. It's just all about getting relaxed and to dream about exotic places. The silver flute, the guitars, the angelic voice, the piano - everyting is there for you to just chill out and feel comfortable. 9/10 for this cd. I would have give this cd 12/10 if Jairamji had included his best song, Temple, to this album. My favourite chill out label, the japanese Dakini Records. 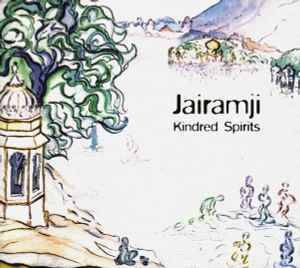 This time it`s a group named Jairamji, here with their debut chill out album. Not a well known name for most people. Personally I didn`t know about them before I saw their live performance at Samothraki Dance Festival 2002, at the chill out stage. As usual, you get a beautiful cover art with this one. If you are after some nice organic chill, this might be the right choice. It`s pretty easy digestible and not very psychedelic, but relaxing. It reminds me a bit of Angel Tears (the project of Momi Ochion and Seb Taylor). Kindred Spirits is a great combination of tribal ethnic sounds combined with dubby ambient. Soulful and spiritual sounding flute grips you tightly and holds you on softly. This is a simple album to listen, since it has a very down to earth feeling to it. The songs are quite long, ranging from eight and a half minutes to almost thirteen minutes, but still there's fillings. All of them are good and listenable. This is a definite morning album. Put this on and have yourself a cup of coffee.